Gold Standard Tank Sealer will stop rust and form a tough, fuel impervious coating while sealing small pinholes and weld seams. Your fuel will never touch the inside walls of your tank again. 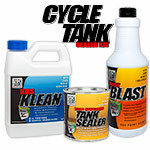 NOTE: Gold Standard Tank Sealer is designed to be used as the 3rd Step in the KBS 3 Step System. Our Convenient Kits can be found HERE! 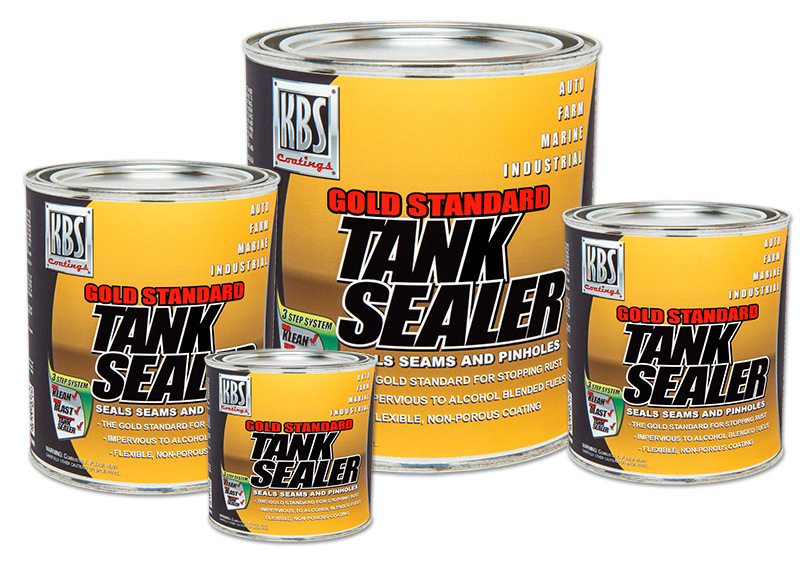 Gold Standard Tank Sealer is a superior, single component, ready-to-use sealer formulated for coating the inside of metal, aluminum & fiberglass tanks. Widely recommended & easy-to-use, this single application coating cures into a tough fuel impervious seal. The entire tank including pinholes & weld seams are permanently sealed to prevent the return of rust & corrosion and clogged carburetors. The Tank Sealer's rock hard finish remains flexible to withstand vibration and the repeated expansion & contraction of the tank! Other sealers are little more than paint or adhesive-type coatings which have poor sealing abilities especially when exposed to today's fuels. Wisely choose Gold Standard for an incredible long lasting seal! Satisfaction guaranteed! 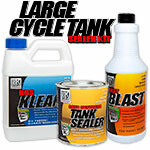 Click HERE to determine How Much Tank Sealer to Order. 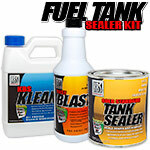 8oz of Gold Standard Tank Sealer will seal up to a 5 Gallon Tank. Pint of Gold Standard Tank Sealer will seal up to a 12 Gallon Tank. Quart of Gold Standard Tank Sealer will seal up to a 25 Gallon Tank. Gallon of Gold Standard Tank Sealer will seal up to a 100 Gallon Tank. Gold Standard Tank Sealer is non-flammable and is environmentally safe. Used to seal my tank. Easy to use, worked great. I have never coated a gas tank before but this process made it super simple and easy and very effective. took a rotor tiller that was my dads and had been sitting for over twenty years at first look I thought there would be no way the gas tank was black it was so full of rust but after a week of soaking it to clean it I coated it and it look like a new tank it works. I've used the KBS system to coat 5 gas tanks to date, from rusty vintage motorcycles to a brand new carbon fiber tank for an exotic Italian bike. The stuff just works. Period. Best I've found. Used this product on the tank from a 1966 Dodge D100. 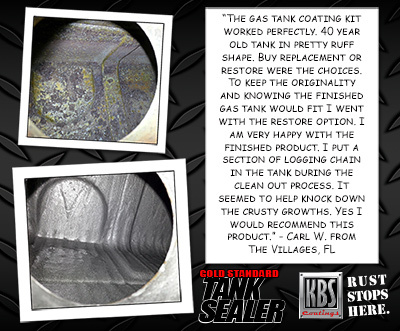 The tank had been previously taken to an acid dipping shop to be thoroughly cleaned of rust, old paint, road grime, etc. Since the metal was clean already, I skipped the KBS Klean and went straight to the etching product, the Rust Blast. After rinsing and drying, applied the Tank Sealer according to instructions. 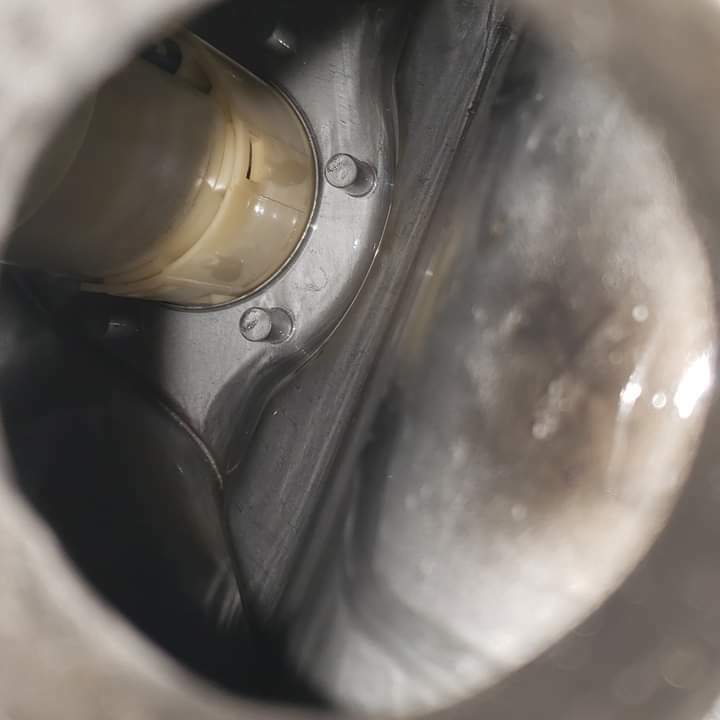 It has left a clearly visible layer lining the entire inside of the tank. The quart can had more than enough product to do the tank. The tank is not yet reinstalled, nor have I done the exterior of the tank yet, so the final verdict is not in yet. But everything looks good so far! Removed pitted aluminum tank from my sailboat and installed a built-in tank out of fiberglass. Just used the sealer to coat the inside of the tank with a foam roller. Seeing it a week later after the full cure and seeing what's left of the roller I used, I'm sure this tank will last forever. It's a hard finish that even has a smooth glossy look to it. So far, I'm happy with this product. Q: I have to seal just the base of a tank only. Can I coat part of the large tank with the Gold Standard Tank Sealer or is it necessary to cover entire interior? A: It is always best to coat the entire inside of the tank. If you do not, you do run the risk of the Tank Sealer delaminating (peeling away) over time at the edges. Was this answer helpful? 20 of 24 Customer(s) found this Answer helpful.